I have written a couple of articles recommending binoculars or entry-level telescopes, but it has been a few years since they came out. And because now is the time when many grown-ups are in a mood to support economic activity, let me review my comments. I think everyone should have a pair of binoculars. They are a tremendously versatile tool for both day and night. Binocular types are identified with a pair of numbers that represent the magnification and diameter of the front lens. For example, 10x50 binoculars will magnify a factor of 10, and the diameter of the front lens is 50 mm (about 2 inches). That makes your naked eyes a pair of 1x7 binoculars. For night viewing, 10x50 binoculars are perhaps the most versatile. Smaller ones might be more portable, but they give you much less light-gathering ability for nighttime viewing. Yes, bigger ones can show you much more, but with more magnification or weight, you would really need to get a sturdy tripod. Within a wide range of binocular brands and models, you generally get what you pay for. I have seen some excellent low-cost binoculars, but many readers will find some extra features that increase the cost will be worth their while. The most useful extra-cost feature for night viewing is anti-reflective coatings. All binoculars have numerous air-to-glass transitions, where reflections will happen, and your image gets worse at each surface. 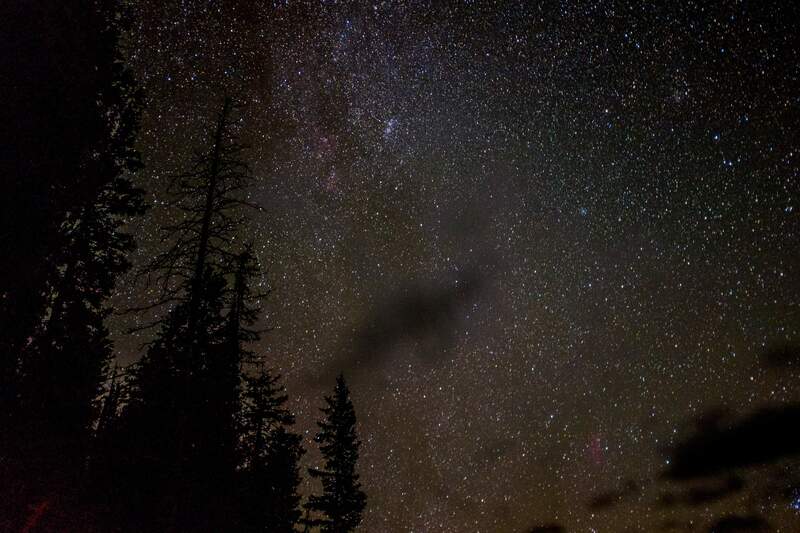 If you wear eyeglasses, you may know anti-reflective coatings make more of a difference in cutting down glare at night, and this is especially true when stargazing. More expensive binoculars tend to have more surfaces coated with better coatings. Those coatings can easily be seen on the glass because the reflections are much darker, and typically appear green. Another thing to consider is what is called eye relief. That is how far from the lens your eye needs to be to see the full image. Lower-cost binoculars generally have shorter eye relief. If you wear glasses, or even just sunglasses during daytime use, you might consider binoculars made with extra-long eye relief – more than 20mm – so you don’t need to remove your other eyewear to use them. An extra-wide field of view, image stabilization and weatherproofing are more options you could consider. As for entry-level telescopes, I am a big fan of Dobsonian-mounted reflectors. Reflectors focus light with a mirror, rather than a lens, so they don’t have chromatic aberrations that you get anytime light passes through any kind of glass. Think of prisms making rainbows – all glass splits light into different colors, and much of the technology going in to lens-making is to overcome this effect. Mirrors avoid it altogether because the light making the image never passes through the mirror. And for telescopes more than 4 inches in diameter, mirrors are much cheaper. The Dobsonian mount is the simplest possible of what is called an altitude-azimuth (alt-az) mount. That means an up-down/left-right motion. By correctly balancing your telescope in this type of mount, it will stay wherever you point it. This monthThere are several great binocular objects you can see this month – the Pleiades, the Orion nebula and the Andromeda galaxy. The Pleiades, or M45, are also known as the Seven Sisters. They are a nice, naked-eye cluster but are an outstanding sight in binoculars. Shortly after dark, they can be found due east about halfway between the horizon and zenith. Orion and other winter constellations are finally making their early evening return. The three belt stars of Orion are right along the celestial equator, so they will be due east when they rise a little after 7 p.m. Bright red Betelgeuse and much bluer Rigel are positioned symmetrically to the left and right of the belt when Orion crosses the horizon. The Orion nebula, or M42, can be seen about 5 degrees south of the belt stars. It is the brightest star-forming region that we can see and is one of the most rewarding targets in binoculars. The galaxy in Andromeda, M31, is just south of the “W” of Cassiopeia and will be very close to the zenith point around 8 p.m. Although dimly visible to the naked eye, binoculars show an impressive fuzzy blob, which is the central core of the galaxy. The spiral arms extend quite a ways out but are much dimmer. The Geminid Meteor shower occurs in mid-December. The shower lasts for a week, and the peak of the shower should be the night of Dec 13. Just to be clear, meteor showers are best seen without binoculars.